This demonstration illustrates acid-base indicators and complex ions. This demonstration illustrates acid-base indicators and complex ions. 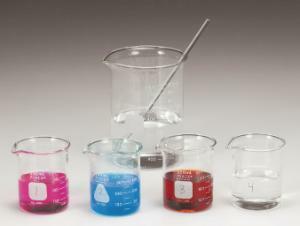 Four colored solutions are prepared: pink, blue, deep red (iron(III) thiocyanate complex ion) and colorless. Mixing the three colored solutions results in another deep-red colored solution — “red wine.” The “wine” is then turned colorless before your eyes when sodium fluoride solution is added. Includes: 14.8 M ammonium hydroxide, iron(III) chloride, hydrochloric acid, phenolphthalein solution, potassium thiocyanate solution, sodium fluoride solution, thymolphthalein solution and instructions. Materials provided for seven demos. Four colored solutions are prepared: pink, blue, deep red (iron(III) thiocyanate complex ion) and colorless. Mixing the three colored solutions results in another deep-red colored solution, “red wine". The “wine” is then turned colorless before your eyes when sodium fluoride solution is added. Includes: 14.8 M ammonium hydroxide, iron(III) chloride, hydrochloric acid, phenolphthalein solution, potassium thiocyanate solution, sodium fluoride solution, thymolphthalein solution, and instructions.